Monster Rainbow Trout – Steelhead Michigan. The recent rains last week brought in a new and significant push of steelhead into the upper sections of the Muskegon River from Thornapple to the Croton dam. The upper section has been fishing well. Water levels are looking good, Clarity in about 5′ – 7′ feet with a stain but, water is very clear. Running mid level at 3000 cfs. Wading would be a little sketchy at this point. Best fishing techniques have been float fishing (Bobbers and spawn) and free style nymphing – Michigan fly fishing. Sucker spawn nymphing has also been good for larger Rainbow trout, Brown Trout, & Brook Trout. Good numbers of both Rainbow trout and steelhead should go well into early June. Hatch fishing should start soon! Rainbow Trout and Brown Trout love hatches on Michigan Rivers. West Michigan Guide Service – Muskegon River – Fishing has been off the hook! Because of the ultra long, cold winter, Steelhead ( Rainbow Trout) is just getting started. Water tempratures have finally reached perfect spawning tempratures. Many bright chrome Steelhead hens are just now starting to spawn on gravel. These fish are still tight in the skein and several weeks from spawning. 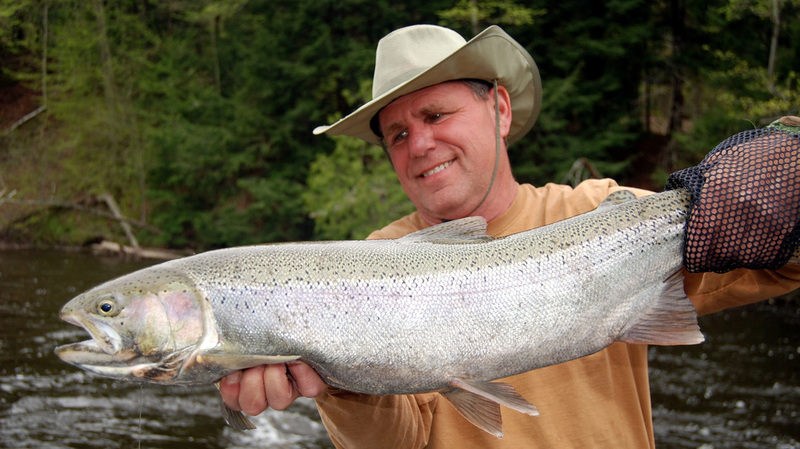 At this rate, we should have decent numbers of steelhead well into early June. Fishing is exceptional right now with perfect water levels and conditions! Both float fishing and fly fishing producing double digit Rainbow Trout, days of fish in the net! Conditions are quickly becoming perfect now with water temperatures in the low 40’s, clearing, and dropping steadily. New fish are constantly entering the river system, while the older, winter steelhead (Rainbow Trout ) have begun to dig gravel and spawn big time! Over the next few days, We should see an increase of the number of spawning steelhead. Best techniques have been fly fishing with small to medium sized egg flies, beads, and black stone flies. Float fishing has also been excellent and top producer, and old school style, pulling plugs has also been rocking a bunch of fish on certain days. Look for some great fishing in the next week or so. West Michigan Guide Service.